Jot down those crazy ideas on these earthy Kraft Scratchpads. Whether it is for your personal or professional use, these make an interesting possession to capture all your creativity. Starting from Rs. 500/- for 10 scratchpads. Earthy kraft notebook to capture all your creative thoughts. Now jot down all those crazy thoughts in one place for future reference. Starting from Rs. 1800/- for 10 kraft notebooks. Customized notebooks for your business to break the monotony of standard notebooks and a great gift to clients. There is always an increasing demand for notebooks around the world. Notebooks capture all your creative thoughts in one place! PrintStop is an expert in providing notebook printing services with custom designs, patterns and sizes. We are a fastest growing online website that creates customized notebooks for customers at affordable rates. Our custom notebooks are designed for all purposes – from scratch pads to business/corporate notebooks, we have them all. In recent days, the demand for online notebooks printing has attained an enormous growth because they are an excellent gifting option too. Whether it is for your clients, teammates, or a return gift, these notebooks will be welcomed by all. Why PrintStop for Notebooks Printing? PrintStop is the best company for notebooks printing. Our customized notebooks are so sought after because we keep an eye out for the essentials that make the notebooks an interesting possession and look super special. Our goal is to make the overall shopping experience speedy, simple and easy for our customers. As a supreme online platform for notebooks printing, we have the right approach to attractive designs and provide customers with the best value for money. PrintStop's website is designed in such a way that it allows customers to choose the product of interest effortlessly. We have ideas for the type of designs that we want to create and also have a fully functional online website, ready to print and ship to customers. We use the latest tools and technology for notebooks printing and shipping. You can create and design them the way you want. Combine writing with style, personalized notebooks in your favorite colors are lovely options for those wanting to keep track of your ideas and thoughts. PrintStop's notebooks printing services are top-class. 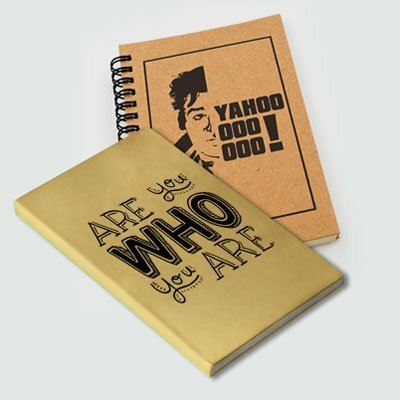 Our notebooks not only help to jot down your innovative ideas but also motivate the brain cells to think creatively. Even if it is to just scribble, the kraft notebooks make the activity more amusing and fun! 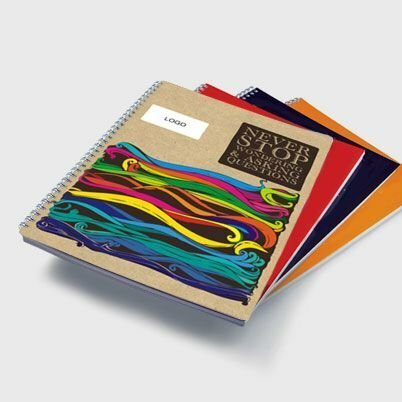 When it comes to choosing the best online store for notebooks printing, Printstop is the right place. It is very important to choose the best supplier to break the monotony of standard shopping experience. Printstop is a one-stop shop and is one of the best suppliers of personalized notebooks. Our notebooks printing, shipping, and delivery services will ensure that you receive the custom notebooks within 6 days. Check out our impressive notebooks printing services right away! What’s a great notebook without a perfect pen? Get personalised promotional plastic pens from PrintStop along with other quality stationery. Contact us now.